September 2015 – Archipelago International is proud to present one of their latest NEO hotels - Hotel NEO Eltari – Kupang. 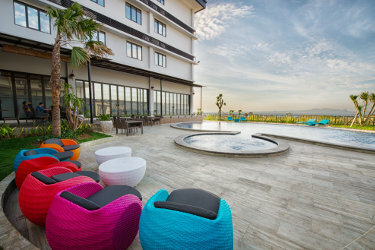 Set in the Kupang city, the hotel soaks up the sights, sounds, and ever-increasing number of business and leisure travelers to this up and coming destination. Spotting the city's potential, Archipelago International presents Hotel NEO Eltari – Kupang, primely located close to the historical airport, El Tari. The hotel has been in operation since June 2015 and features 137 stylish and comfortable guest rooms across four categories, as well as a coffee shop, a swimming pool and a spa & fitness center for guests' enjoyment. 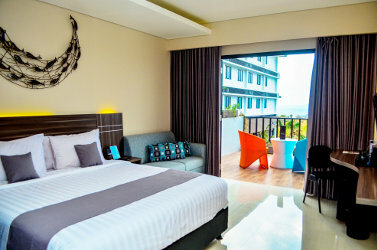 Furthermore and specially for business travelers, Hotel NEO Eltari - Kupang also features three meeting rooms and a ballroom with truly high-speed complimentary internet connection, and ample parking spaces available from the lobby. All of the guest rooms are equipped with a full set of amenities and up-market facilities such as mini-bars, coffee makers and top of the line beddings with high knot count cotton linens and duvets. By offering such premium features, NEO hotels stay true to the group's credo: that well designed and exciting hotels do not need to be expensive. “NEO Eltari - Kupang is a fantastic hotel just outside the Kupang airport entrance and with a beautiful panoramic view, we couldn’t have asked for a better location for our first NEO in NTT.The pool and the ballroom are great amenities to draw in the visitors and local businessmen alike, this will be a very successful property and we are proud to have it in our portfolio." said Winston Hanes, Regional General Manager of Archipelago International.